Jerome Just one more Song! 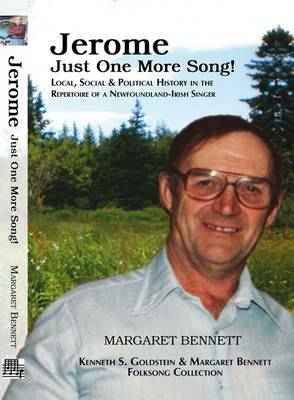 A Local, Social & Political History in the Repertoire of a Newfoundland-Irish Singer. This timeless Songs collection, recorded in Codroy Valley, Newfoundland, 1980 by folklorists Kenneth S. Goldstein and Margaret Bennett , is a tribute to singer Jerome Downey. This is not only a song book but is a Local, Social & Political History of Newfoundland's Codroy Valley. To appreciate the way of life in any part of Newfoundland, the reader should bear in mind that, until 1949, Canada was another country. Anyone born before that year, is, first and foremost, a Newfoundlander, belonging to a unique island with a long history - it has the distinction of being Britain's oldest colony. Given that Canada's newest province was less than twenty years old when Bennett first went there, it was very common to hear folk explain, 'I'm not a Canadian, I'm a Newfoundlander.' Thus, to understand the social, cultural and historical context of a song, it is essential to appreciate where it comes from, and especially to acknowledge the people who compose and sing the song. 'If there is no land or work, there are no people, no livelihood, no stories, no music, no songs...' (Gavin Sprott) In the Codroy Valley, the folk who have worked on the land or fished the rivers and coastal waters for nearly two centuries are a mix of Irish, English, Scottish Gaels, French and Mi'kmaq. For as long as anyone remembers, they have enjoyed getting together for 'a few tunes', songs, yarns and a cup of tea. The kettle is always on the stove and, more often than not, a few glasses appear from the cupboard and make their way to the kitchen table- they need no excuse for a ceilidh or a kitchen party, with accordions, bagpipes, fiddles, guitars, spoons and mandolins as well as songs that would lift the heaviest heart. To Jerome and his people, songs and music are way of life. Kenneth S. Goldstein; Margaret Bennett; Newfoundland Folklore Collection; songs of the Codroy Valley; Jerome Downey; Newfoundland-Irish Singer; Newfoundland Irish Folklore; Anthropology; the onset and progression of Alzheimer.